This action-heavy EPIC FANTASY SERIES OPENER is like a sword-and-sorcery Spartacus set in a richly-imagined world. It starts with a shipwreck following a magical storm at sea. Horace, a soldier from the west, had joined the Great Crusade against the heathens of Akeshia after the deaths of his wife and son from plague. When he washes ashore, he finds himself at the mercy of the very people he was sent to kill, who speak a language and have a culture and customs he doesn't even begin to understand. Not long after, Horace is pressed into service as a house slave. But this doesn't last. The Akeshians discover that Horace was a latent sorcerer, and he is catapulted from the chains of a slave to the halls of power in the queen's court. Together with Jirom, an ex-mercenary and gladiator, and Alyra, a spy in the court, he will seek a path to free himself and the empire's caste of slaves from a system where every man and woman must pay the price of blood or iron. Before the end, Horace will have paid dearly in both. 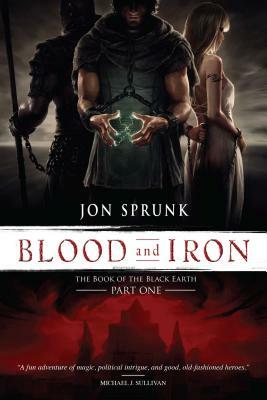 Jon Sprunk is the author of the Shadow Saga--Shadow's Son, Shadow's Lure, and Shadow's Master--which has been published in seven languages worldwide. An avid adventurer in his spare time, he lives in central Pennsylvania with his family. "Sheer fun, with engaging, pulse-quickening action, sympathetic characters and intricate intrigue.... Definitely a series to follow." "The clear writing and fast pace make [this] a fun adventure of magic, political intrigue, and good old-fashioned heroes." "Sprunk’s world is fascinating and original, reminiscent of ancient Sumeria and Babylon…"